Our adaptive program provides therapeutic recreation for children and adults of all abilities. Experiences are tailored to meet the needs and goals of each individual. Some campers/students may require two counselors/instructors, while others may be appropriately paired with one counselor. 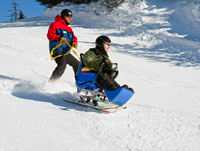 We also offer an inclusion program with our ski and snowboard programs for children. This gives a child with special needs the opportunity to socialize with his/her peers while still maintaining the support he/she needs through the adaptive program. There is no age limit for the program. Half and full day lessons are available. Our highly trained instructors will evaluate each individual's needs and goals and determine their equipment requirements. 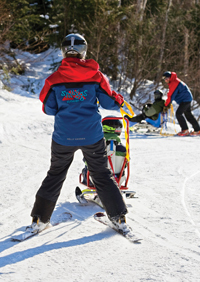 Smugglers' adaptive program maintains an inventory of adaptive equipment including mono-skis, bi-skis and a slider. Snowboarding is also available. "By far the best program we have found! Above and beyond our expectations - the staff was amazing and the quality of the program made our vacation!" "As a father of a daughter with disabilities I am used to having to conform to the typical world, your program and the people involved in it adapted to my family and its needs. It was heartwarming for me. Thank you so much for your services." Advanced reservations are required in order to meet each individuals needs. Due to popular demand we have limited space during our peak weeks. Reservations are on a first come, first serve basis. Please make your reservation as early as possible. The adaptive camp/lesson must be canceled at least 24 hours in advance for a full refund. No refund will be given within 24 hours of the start of camp/lesson.